In an important ruling issued last week, a federal judge allowed fraud claims asserted by art collector Andrew Hall to proceed against a former art-history professor and her son, Lorettan and Nicholas Gascard, alleging that they sold him a number of forged Leon Golub works. The court’s decision is instructive for collectors who may have been duped into purchasing forged artworks, only to discover many years later that they were fakes. Hall purchased twenty-four Golub works from the Gascards (in some cases directly, and in others, through auction), for more than $600,000. As it turns out, however, every single one was a fake. After discovering that the works were forgeries, Hall commenced a lawsuit asserting claims for breach of warranty and fraud, among others. The Gascards moved for summary judgment, and the court granted their motion with respect to Hall’s breach-of-warranty claim on statute-of limitations grounds (as a general matter, these claims are governed by a four-year statute of limitations, not subject to a “discovery rule,” meaning that collectors, like Hall, may not pursue such claims unless they realize they have been duped within four years of the sale). But the court permitted Hall’s claims for fraud, conspiracy to defraud, and unjust enrichment to move forward. In support of his claims, Hall adduced a trove of evidence that the Gascards may have known that the works were forgeries at the time of the sales. For example, the Gascards failed to provide documentation supporting any of the statements of provenance they produced for the works, and Nikolas Gascard even admitted that some of the provenance statements were false. Moreover, the Gascards represented unequivocally that the works were authentic; they never claimed that they merely believed the works were by Golub or that they were painted in the style of Golub. Finally, Lorettan Gascard is both an art historian and an artist, and she took painting classes with Golub himself in 1969 and 1970, so the evidence supported Hall’s claims that she became familiar with Golub’s distinctive style, and therefore that she knew, or should have known, that the works were forgeries. The court rejected the Gascards’ argument that Hall unreasonably relied on their representations that the works were authentic. The Gascards argued that Hall, as a sophisticated purchaser who had access to multiple experts, should have done more than simply rely on the Gascards’ say so regarding authenticity. The court disagreed, however, noting that the Gascards had managed to convince Sotheby’s and Christie’s that the forgeries were real. 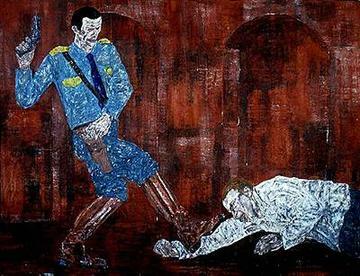 The court also pointed out that Hall hosted Golub’s son, Stephen, and Golub’s former studio manager, Sam Kunce, at an event at Hall’s home where some of the fake works were on display, and neither man had “raised any question about the potential authenticity of those works.” Accordingly, the court could not conclude that it was unreasonable for Hall to have relied on the Gascards’ representations about authorship. In the end, Hall may proceed to trial on his fraud claims. But the court’s decision is instructive for art collectors who may not discover for years that their artwork is inauthentic. Because no “discovery rule” applies to breach-of-warranty claims, collectors in these situations may be confined to fraud-based claims, which as a general matter are much more difficult to plead (and to prove) than straightforward breach-of-warranty claims.